A 27-year-old Baltimore man who was critically injured a week ago during a brutal arrest has died from his injuries, family and a hospital spokeswoman told the Baltimore Sun on Sunday. 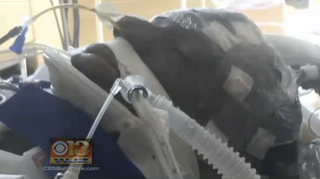 Freddie Gray, who was placed in a medically induced coma with a broken spine at Shock Trauma, died just hours after a protest against police violence at the Baltimore police headquarters, the report says. Gray's stepfather, Richard Shipley, who has acted as a family spokesman since the incident, confirmed for the newspaper that his stepson passed away Sunday. It's unclear just how Gray was injured, and police have not released any documents or reports relating to the arrest, the report says. But the family's lawyer says that officials may be engaged in a cover-up. "We believe the police are keeping the circumstances of Freddie's death secret until they develop a version of events that will absolve them of all responsibility," William "Billy" Murphy Jr. said in a statement, according to the Sun. "However, his family and the citizens of Baltimore deserve to know the real truth; and we will not stop until we get justice for Freddie." Murphy, in his statement, also said that Gray was healthy at the time of the arrest, which Murphy said occurred "without any evidence he had committed a crime," the Sun writes. According to the statement, Gray's spine was "80 percent severed at his neck" when he was in custody. The statement also said that Gray "lapsed into a coma, died, was resuscitated, stayed in a coma and on Monday, underwent extensive surgery at Shock Trauma to save his life." Murphy also said, "He clung to life for seven days" before dying Sunday morning. At a news conference Sunday afternoon, the Sun reports, Mayor Stephanie Rawlings-Blake and Police Commissioner Anthony W. Batts said that they are committed to providing the public with information about the circumstances of Gray's death. Read more at the Baltimore Sun here and here.